It is important to consider the potential of native from a conversion standpoint, and this is where native search comes into play. This post explores three key differences between native and traditional search. Native advertising has been predominantly used for top-of-the-funnel initiatives, often with the goal of increasing brand awareness. However, it is important to consider the potential of native from a conversion standpoint, and this is where native search comes into play. For example, Zillow is a native search engine in the real estate sector. Moreover, native search engines often require the user to input a number of data fields in order to get the results they are seeking and those results are native to that website. The most obvious difference between traditional and native search engines is the type of results they generate. Traditional search engines provide users with a doorway into the information they are seeking but typically offer a very broad set of results that require the user to continue to search and refine. These search engines are constantly crawling and indexing the entire internet, then ranking those results so when a user enters search terms, the engine is able to provide a set of links, (including paid links), that match the terms the user is interested in. Native search occurs on the actual site the user has already navigated to and provides a much more refined set of results that are specific to the content/product/service they are seeking. Rather than scour the entire internet when a user is looking for a specific product or service, native search engines provide results that are better curated and more relevant for the user, thus allowing them to make a quicker decision on whether or not to purchase. Because native search generates more relevant results and enables easier comparison shopping, it leads to more immediate conversions. Traditional search might enable some comparison results for specific product and service categories, but its capabilities in this regard are not very robust. The comparison process is fragmented when using traditional search, forcing the user to continue navigating back and forth from the search engine when comparing products and services. This all changes with native search, which allows the user to instantly compare prices and products regardless of vertical. This means that once the user lands on your website he or she stays there, and doesn’t have to navigate back to the search engine. For example, KAYAK is a great native search engine for comparing travel services. When a consumer visits KAYAK, he or she can instantly compare travel offers from a variety of providers. For a travel brand, displaying a native search ad on KAYAK is an excellent way to get in front of consumers while they are active in the purchasing process. This is only one example, and there are plenty of other popular native search engines from an array of industries to consider, such as The General for car insurance and Amazon for a range of consumer products. Native search allows these brands to monetize all users that visit their website, whether they will convert or not. Traditional search engines charge brands for the top spots in the search engine results page (SERP), regardless of whether or not the user actually converts and becomes a customer. For expensive keywords, this can pose a problem for new and/or existing brands to recoup the cost of acquiring the traffic. If these users don’t convert to paying customers, the brand has no way of monetizing this user and must attract new users that will convert. Native search allows these brands to monetize all users that visit their website, whether they will convert or not. If a brand only displays its own offers, users that don’t convert end up going back to the search engine or conducting a new search altogether and the brand loses the chance to monetize that user. With native search, the brand can display additional’ offers, including competitors, to give users more options. If the user decides to click on the native search ad, the brand can now monetize that user and recoup the cost of the keyword search. When a user clicks on the paid search result they are taken to the website of the company that purchased that keyword(s). Let’s call that Company A. 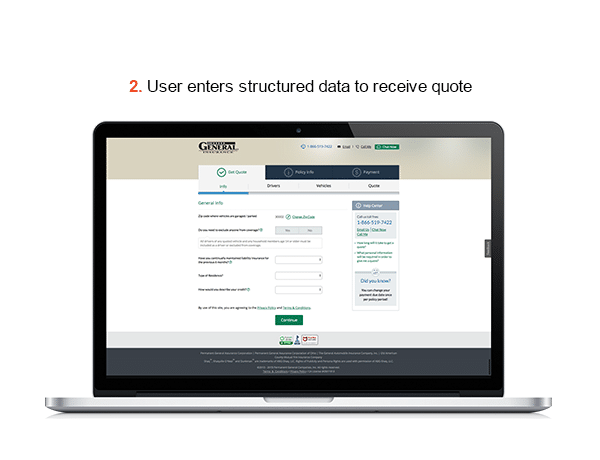 The user then fills out Company A’s form needed to receive a quote. Typically, a car insurance shopper likes to compare 3-5 different quotes before making a decision. If the user isn’t satisfied with the quote they received from Company A they will navigate back to google and click on another company’s link. Company A paid (via CPC) to have their search ad displayed but was not able to convert the user so they ended up losing money on that search. 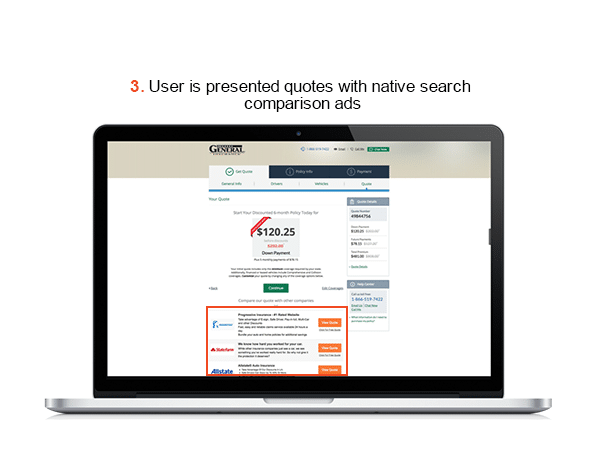 By leveraging native search, Company A can now display additional quotes on their results page. This allows the user to click and compare other car insurance companies. When the user clicks to compare a quote from a competitor, Company A is now getting paid by the other car insurance company via a CPC. This allows Company A to recoup the cost of the search and allows helps to improve the user experience, so they aren’t navigating back and forth from site to search engine. All this said, marketers should continue to leverage traditional search engines, but they should also be complimenting traditional search efforts with native search as much as possible. Brands can take this concept a step further through the use of predictive analytics, which enables them to quickly determine whether a user that visits its website is likely to convert. If they aren’t, the brand can instantly display additional offers and maintain the ability to monetize that user. All this said, marketers should continue to leverage traditional search engines, but they should also be complimenting traditional search efforts with native search as much as possible. This is particularly important for brands in high-consideration product and service categories where the consumer is likely to shop around before converting. 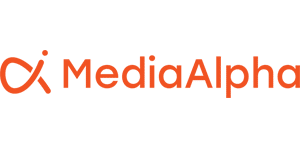 When determining your media budget consider allocating a portion to native search and you’ll see higher conversion rates and wider margins than ever before, especially when compared to display. This article originally appeared on the blog of the Native Advertising Institute, an organization dedicated to helping marketers become successful with native advertising. It provides insights and tools such as case studies, best practices, how-to guides, analysis, industry news and research to make it easier for marketers to drive real results with native advertising.